During Epcot’s Flower and Garden Festival, guests have the opportunity to try many new foods not commonly offered in Epcot. 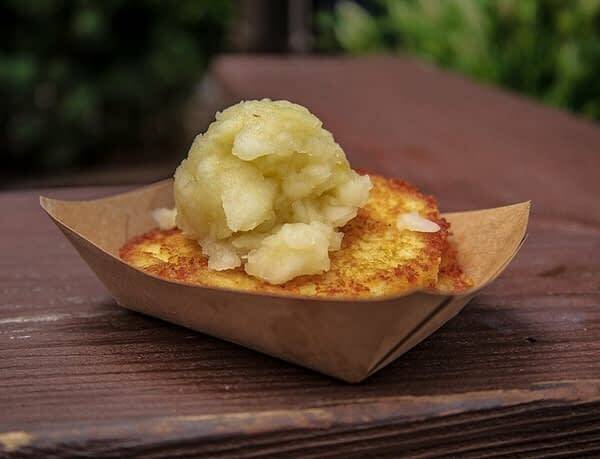 In the Germany Pavilion, the Bauernmarket kiosk offers German drinks and light fare such as this: potato pancakes with house-made applesauce! Potato pancakes with applesauce are nothing new to me — we eat them during Passover. These pancakes, while not as good as my mothers, were still really damn good. The pancakes were fried to perfection, and the from-scratch applesauce offered a nice, tangy bite to the potato. At $4.25 these were an inexpensive snack, and I would absolutely get them again.